The township now known as Parkers Prairie was organized as Jasper on January 4, 1870. Jasper was the name of a mythical revolutionary war hero after whom many counties and townships all over the country were named. His partner was Newton after whom Newton township was named. Ben Pease, the first settler in the village, chose the name. The first election was held on January 24, 1870 at the store of Henry Asseln, the first merchant in the village. The petition to organize the township was signed by 21 of the original settlers. Their names were: Gustaf V. Linquist, Peter O. Nelson, Peter N. Lindquist, Jonas Lindquist, John G. Nelson, John N. Nelson, P. Smith, Peter Lindall, Wyent Van Alstyne, Walter L Pease, Archy McMurdy, Benjamin S. Pease, E. Wedeken, W. Wedeken, J Draper, Richard Handy, Will Morrison, John Miller, G. W. Levesten, and H Pelky. 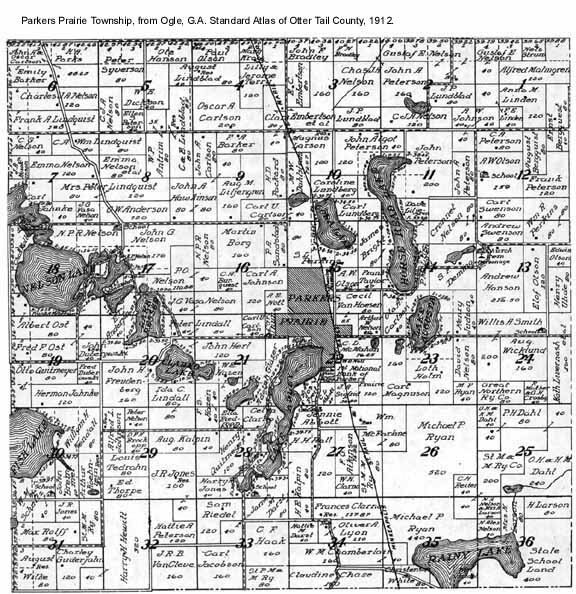 The name of the township was changed on March 1, 1873 to Parkers Prairie. This change was introduced by John G. Nelson, the first State Senator from Otter Tail County, to commemorate one of the original surveyors. The township was first surveyed by a party led by Warren Adley of Osakis. Lake Adley is named for him. Parker was the one on the survey party who first saw the prairie ahead after he climbed a tree. When they returned to Osakis, Parker and another man were drowned while attempting to ford the Long Prairie River. Parkers Prairie was the first area in Otter Tail county to be settled by people of diverse religious and ethnic background. The first homsteaders arrived in 1868 and staked their claims along the edge of the prairie. Its early settlement was due partly to the fertile soil but primarily to its geographical location. Settlement in central Minnesota after the Civil War generally moved from southeast to northwest so this was the place closest to those already settled. There was also a state road from Osakis to Otter Tail city that was marked out. There are about fifteen lakes in this township, ranging in size up to a half section. 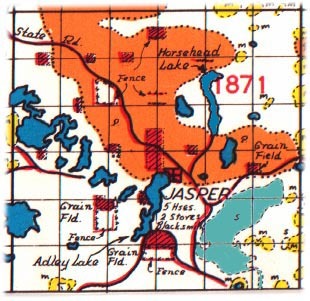 The largest is Nelson lake (named for the Nelson brothers settled next to it), with Rainy, Horse Head and Adley (named for the head of the first survey party) following in the order of their size. Other lakes in the township are Fish, Cora, Clarno (also named for an early settler) and lake Augusta. The lakes are the chief sources for natural and artificial drainage in the township, as there are no rivers or streams except those small creeks which feed the lakes. The lakes starting in section 7 form a chain leading to lake Adley and the village. Before there were roads, the farmers hauled their grain to town during the winter on this chain of frozen lakes. The Soo railroad runs north and south through the township. This road was completed in 1902 and rapidly became a source of great benefit to this part of the county. It gave the farmers a ready outlet for their products and greatly increased the value of the farm land. The high prices for land, particularly in 1917-18, caused many of the farmers to sell their farms and move to town. The settlement of Parkers Prairie began early in the summer of 1868. I shall try to give you an idea what it meant to the pioneers of those days to establish a home on the then frontier wilderness of Minnesota. I can best illustrate this by describing the experience of my Father, J. W. Saunders, who arrived here on the 17th day of July 1868, with a family of four children of which I was the oldest, being twelve years of age. Taking a survey of our equipment and possessions as they were at that time, I find they consisted of the following: 1 yoke oxen, four cows, some younger cattle, 12 sheep, one spinning wheel, one covered wagon, one plow, axe, grass scythe, 1 2 inch auger, cross saw, one broad axe, one rifle, and one shotgun. Father, Mother, and four small children, four barrels of flour and less than $50 in money; thus equipped, we were here to begin the development of our new home. During the latter part of August, Father made a trip to Sauk Center with his ox team, taking five days for the trip and bringing letters and news from the outside. On his arrival at Sauk Center, he found the people terribly alarmed, as the Indians at Fort Ripley, (near Little Falls) were reported to have gone on the warpath and were massacring the Whites were ever they were found. Settlers were fleeing into Sauk Center from all directions, with all the worldly possessions they could carry. All seemed to be terror stricken which was not to be wondered at, coming so soon after the great Sioux massacre of 1862 when so many settlers lost their lives in Minnesota. The old Indian stockade at Sauk Center was fast filling up with men, women, and children. Arriving home from his trip, Father and Mother discussed this difficult problem for various angles and it seemed quite difficult to come to a definite conclusion at what was the best to do under the circumstances. Finally they settled the question by saying, �We will stay right here. If the Indians want to get us they would kill us before we could get to Sauk Center, as they are calling on us nearly every day.� We continued making preparations for the winter, which would soon be upon us. Up to this time I usually accompanied my Father, helping him when I could; however, after the Indians scare I was left at home with Mother and children, whenever Father had occasion to be out of calling distance. And about this time one afternoon as I was playing around our tent with the children, I spied two Indians standing by one of the rests supporting our sun shade. Glancing around for Mother I saw her looking at the Indians. She had a smile on her face and seemed to welcome them. They soon made their mission known by presenting a small sack and opening at and motioning with their hands as if filling it with something and at the same time handing her a few young Mallard ducks. Mother understood their language, took the sack and filled it with flour although we felt the need of the flour more than the ducks. We could shoot ducks whenever we wanted them. Later we learned the disturbance headed by Chief Hole-In-Tht-Day did not materialize. In August, Charles Swenson and Andrew Hanson arrived at Parkers Prairie, coming directly from Sweden. Arriving at St. Cloud they bought a yoke of oxen and a wide tired wagon such as the government used for transporting supplies to the forts. Well do I remember how pleased they were to find someone here who could talk to them in their own language, as Mother and I could talk Swedish, being unaccustomed to the conditions in this new country, they were constantly seeking advice and knowledge to help to make a home in the wilderness. About this time in August Henry Asseln (later a well-known merchant of this community) arrived at Parkers Prairie, coming from Decohah Iowa and bringing with him the first merchandise offered for sale in Parkers Prairie. I happened to be present when he opened up his stock and as I remember it the items were powder, shotgun caps, bar lead, steel traps, blackstrap molasses, tobacco, tea, yeast, karosene, and matches, to which he continually added. At that time his merchandise was hauled by team from St. Cloud, the terminus of the railroad. Henry Asseln one was a thrifty and progressive businessman developing a large trade extending over a wide territory. During the time of the Indians scare we were living in our tent. It was our custom to use every precaution for defense in case of a surprise attack. On retiring from the night, Mother and Father slept on one side of the tent and the other children and myself on the other side. Father and I occupied the center space with the rifle and shotgun loaded and ready for any emergency. One night when all were quietly slumbering we were suddenly aroused by reports of gunfire. At the same time the tent collapsed, completely entangling us in its folds and terrifying all within. To say there was confusion would be putting it mildly. After untangling ourselves from the rack and finding there were no Indians present we found one of our own guns had been discharged and a shot had taken effect in our tent poles supporting the tent and causing it to collapse. As someone has to bear the blame for our misfortune the final conclusion was that during the night I had kicked to the hammer of the gun and caused its discharge. The following morning the sun was shining and we soon gained our usual composure and found no one the worse for our experience. Among those who called on us during the month of August 1868 while we were quartered in our tent, were John G. Nelson and Gustav Lindquist coming from Chisago County near the same place that we had immigrated from a short time before. Well do I remember how interested we were to visit with them. While here they all located claims on the west side of the Prairie. The following year they returned and occupied their claims permanently and all were prominent in the development of this community. During the fall of 1868 the selection of squatters claims was all confined to what is now the township of Parkers Prairie. As the winter season began few people remained to abide through the winter. I mentioned the Ben Pease family, Carl Swenson family, Andrew Hanson, the Handy brothers (Charles and Richard) and G. Lindquist. As I recall that period It was a long loathsome cold winter with three feet of snow, without roads or communication with the outside world or anyone else. During the winter Carl Swenson and Andrew Hanson manufactured the first lumber products. The mill was established on the east bank of the Lake near where the old Swedish Lutheran Church now stands. The mill was equipped with a whip saw and two men supplied the power. Andrew Hanson, the stronger of the two, handled the upper end of the saw, pulling the upward stroke and Carl Swenson pulling the downward stroke. This was a very slow process, yet they sawed considerable lumber during the winter. During the winter we were anxiously looking forward to the coming of spring and the influx of many settlers. The first to arrive was the Ed Livernash family coming here from Sauk Center during the month of March. They brought their claim shanty already for erection, shoveling away the snow, and erecting two by four studding, covering the side with rough boards, and roofing with white canvas. All was completed in a short time. During the following summer the country was fast becoming occupied with new settlers. I feel I cannot conclude this article without mentioning our first efforts in establishing a school. Our first schoolhouse was built of round logs and covered with a dirt roof. The size of the roof was 12 feet by 14 feet with puncheon floor. This floor was prepared by cutting logs of proper length, splitting in halves, and laying them on the ground bark side down, and then smoothing the surface with an adz. This tool was quite popular with frontiersman. A table was provided lengthwise of the building with wooden benches on either side for seats. Scholars sat facing each other across a table 3 1/2 feet wide. When inside the building it was possible to reach the roof with your hand at any point. This log hut was located on the Cyrus Smith claim a short distance north of where Bert Erkenbrac now lives. Our teacher was Mrs. Azariah Smith, who was the Mother of our present townsmen, Willis A. Smith. It was generally understood the teacher was to receive one dollar a month for each pupil attending school. As I recall those school days there were sixteen scholars and school continued about two months during the late fall and early winter. The names of the scholars attending school, as I remember were, Sherman Smith, Tuie Smith, Willis Smith, Ann Livernash, Nellie livernash, Mary Livingston, Sarah Livingston, Lucy McLaughlin, Kate McLaughlin, Amelia Draper, Alvin Hazen, Alvina Lamb, Frank Saunders, Lillian Saunders, Emma Saunders, and John Hower. Thus began the first educational institution in southeastern Otter Tail County. As there was no money to spare in the community it was understood that the teacher�s salary would be provided by the patrons of the school by donating vegetables and whatever other articles that could be spared. Mrs. Smith was also our first Sunday school superintendent. (Her husband leading in the singing.) Mrs. Smith was the only school teacher in southeastern Otter Tail County until the establishment of our district school system. She also taught school in various homes. She will always be remembered by those who knew her as the most unselfish self-sacrificing woman of this community and many of the younger generation of that time owe much of their Christian influence to the efforts of her and her husband, Azariah Smith. Having lived in this community for more than 60 years, it has been my privilege to observe the development of this community step-by-step and when I compare the crude efforts for education in the beginning with our present magnificent school building and complete facilities for education, I cannot but feel proud of the fact that I have been with you all these years and shared with you in this wonderful progress and development and I hope the good work will continue. I thank you. Paper read by Frank Saunders at the parent in teacher meeting in 1928 at Parkers Prairie, Minnesota. Provided by Jay Guy, Frank�s Great Grandson, 2004. Caught in a winter storm. Together with three other residents of Parkers Prairie, I had the worst experience of my life on the 8th and 9th of January 1873 which was by far the most severe and fatal in its effects of any storm of which there is any record in Minnesota. It is doubtless desirable to place in print such experiences as historical data. On the morning of the 8th of January at six o'clock P. O. Nelson, John N. Nelson, Peter N. Lindquist and myself each driving an ox team and sled loaded with wheat started from Parker Prairie for Otter Tail city, a distance of twenty-five miles which will be conceded to be a big drive for oxen in one day. Not a single settler lived on the road. The weather was calm, cloudy and warm, so that a few rain drops fell about daylight. The snow being middling deep and the road but little traveled, our progress was slow. When we came to the edge of the prairie in Girard we concluded it suicidal to try to go farther and the oxen could not he forced to go aginst the wind. Besides we had to hunt for the road, as the track was becoming entirely obliterated. After a short consultation we turned, back into a poplar thicket we had just passed, behind a low ridge and immediately went to work preparing to camp out in what proved to be the worst blizzard before or since known, We first tied our oxen close together in the best sheltered place we could find and covered them with blankets; then emptying two sled boxes of their sacks, we raised them on edge in shape of an L, with the angle pointing toward the northwest to break off the wind as much as possible. Our next effort was to kindle a fire with dry poplar brush. The cold was rapidly becoming more intense, and the snow was beginning to fill the air, we kept up a fire all night. We made coffee and ate our lunch, taking turns in cutting and dragging brush for the fire. The next morning we decided to try and get home that day if possible, We left our wheat covered up in -the snow, hitched two yokes of oxen to empty sleds, and with our camping outfit started for home about nine o'clock in the morning. One man walked ahead all the time to look for the road and avoid drifts, Every half hour lie would be relieved and would crawl into the sled and cover up with blankets. In this way each took his share of the hardships and none of us became entirely exhausted. At times we encountered impassable snowdrifts. Thus we worked all day and succeeded in reaching home about dark on the 9th very much tired out. The greatest care had to be taken that no one should fall asleep, as with the intense cold and our tired condition it would have proved our last sleep. The five men who had passed us on the 8th reached Otter Tail, and nothing was heard of us on the 9th or 10th. They supposed that our party had perished and we were counted among the great number that were lost in that memorable storm, and such a statement was telegraphed to St. Paul. Parties who traveled on foot from Otter Tail to Parkers Prairie two days after the storm was over, looked carefully by the way for signs of us, and they expected to find four men and teams stiff and half covered with snow. They found our camping place where one or two acres was completely cleared of brush and poplar trees, All our tracks were completely covered by the hard packed snow, It is needless to say that when they found us all at home and well, their gloomy forebodings were changed to rejoicing. Places of birth for Parkers Prairie Township in the 1905 state census.